Born in 1992, Almancil Karting is a leisure and competition complex, that's available for all lovers of the most accessible motor racing sport: Karting! Open the whole year, the Almancil Karting, inaugurated by Ayrton Senna, racetrack is a 760m length replica of the former F1 Brazilian racetrack, named Jacarepegua. The Almancil Karting receives over 250.000 visitors every year. 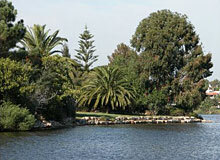 Located in a Leisure Complex nearby Almancil, IP1 Highway, National Road EN125 and the Faro International Airport. 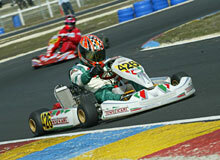 Also, Almancil Karting is only 5 minutes away from the extraordinary Quinta do Lago and Vale do Lobo beaches. It's the perfect place for spending quality time with your family and friends. The park has water attractions for all tastes, some totally unique in the country, such as the Banzai, which give moments of pure adrenaline, joy, fun, adventure and relaxation. Famous for the exciting Black Hole Whirlpool, and the park also has shops, bars and a restaurant. 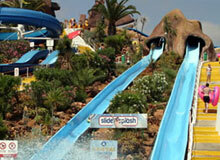 Atlantic Park offers all sorts of twisting slides, even a 'twin' Kamikaze and the 'Rio Grande'. There's a deep diving pool for the brave, and a children's pool which allows parents to relax while the very young enjoy themselves. 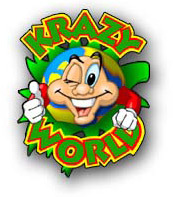 Krazy World has been established for a number of years and has undergone many changes and improvements throughout this time. Some regular visitors to Algarve may remember it as Dutch Crazy Golf, American Krazy Golf or just Krazy Golf. Each year new attractions are added and services are improved. 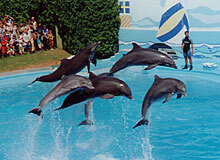 The main attraction are dolphins who give three shows a day in a large arena. The shows are roughly half an hour each, and there is enough of them to last you a day. The shows are very entertaining and original, which makes it good value. 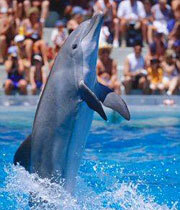 It is possible to join dolphins in the water for a "dolphin experience" but you must pre-book. There are seals & sea lions also giving three shows a day and you can also see the aquarium with numerous sea creatures and small tiger sharks. There are also parrot shows, a play area, theme rides and a swimming pool. Zoo Marine is situated on the E125 near Albufeira on the left hand side. There is a loop road which allows you to cross the road and join traffic going in the opposite direction.